When it comes to scouring web search results for interesting information, you can usually tell something happened by reading the trends. If words keep showing up on search lists, there’s a reason for it. (Just like there’s a reason some search terms are banned from Google Instant Search.) Well, after Sunday’s announcement of the death of Osama Bin Laden, searches related to Osama exploded across Yahoo’s search engine, and the company started to track them. 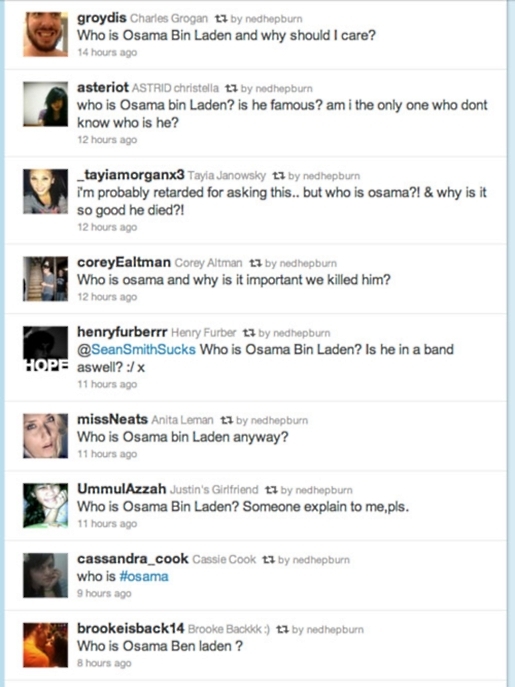 According to Yahoo’s search blog, two-thirds of Osama Bin Laden searches came from teenagers who didn’t know who Osama Bin Laden was. As the Boing Boing thread pointed out, there would come a time when 9/11 would retreat from the general consciousness, but it’s been less than 10 years since the most devastating terror bombing in US history. These kids were alive and presumably school-aged when this happened (and they’ve had 10 years worth of learning about the incident, as well as hearing about it daily on television due to the wars in Afghanistan and Iraq), so how could they not know this? More importantly, why do you ask Twitter rather than simply look it up yourself and spare the world a permanent record of your ignorance? Kids these days, get off my lawn, etc.